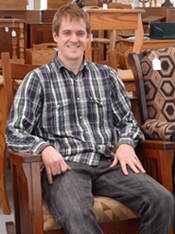 Amish Furniture Factory Blog | Learning & Loving Amish FurnitureVideos! The Yorktown Dining Chair is distinctive with its three contoured back slats. We’re showing the Yorktown in a combination of two luxury woods and a clear coat to create a natural two-tone look. The outer frame is in walnut. The seat and back are wormy maple, a special type of brown maple. What makes wormy maple distinct is that it is harvested from closer to the outside of the tree, so it has rustic and stylish worm holes. Call us if you’re ever looking for a custom finish or combination of woods in your furniture. The Yorktown is available as an arm or side chair, or as one of several types of bar stool. The Sheridan Trestle Table is available at a smaller size than most hardwood tables. Sometimes you’re looking for a little kitchen-sized table. And this one is perfect at 36” by 48”. It also comes in larger sizes up to 42” by 60”, as well as taking 12” leaves. We’re showing the smallest model with no leaves. It seats four. With two leaves, this table seats six, but they’re stored inside the table for now. The table on video is oak with Tavern stain, as are the Ventura Dining Chairs. The Imperial Double Pedestal Dining Table has a base that is too big and strong to call a single pedestal. 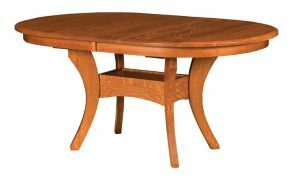 We’re showing the 48” round table with two leaves for a 48” by 60” table. This table’s two-tone custom finish starts with an unusual maple top and clear coat. This special kind of brown maple, called wormy maple, is harvested from close to the outside of the tree where the forest ecosystem has blessed it with a rustic look. The base is walnut with Malaguania stain. Since we work directly with craftsmen, you can call and ask us about arranging for an unusual wood or custom finish. The Conner Dining Chair is a Mission-style chair that comes upholstered. The chair in the video is quarter-sawn white oak with Michael’s Cherry stain and London Tan leather. We’ve pictured the side chair, but an arm chair is available, as well as bar stools at 24” or 30” seat heights. The Brandberg Dining Chair is a Shaker-style chair with a classic ladder back. The base has a skirt and stretcher bar curved around it, and the seat has comfortable saddle scoop contouring. We’re showing this chair in oak with the New Carrington stain. 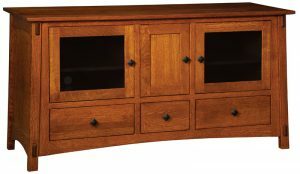 The McCoy TV Stand comes in several models with a lot of customizations possible for each one. What we’re showing on video is closest to the 3 Drawer 3 Door model on the left, but the one in the video is 60” wide, and you can see that we’ve flipped the openings. On these TV stands, you can mix and match drawers, doors, adjustable shelves and openings for your electronics. You can even transform any drawers into media drawers with separators inside. The wood in the video is quarter-sawn oak with Light Asbury stain. In this video, Laura uses an Ethan Leg Table to show you how to put your new leg table together. Leg tables arrive with the top fully assembled, and with the legs and leaves separate. To add the legs, prop up your table top on its side. The underside of the top has spaces for the legs in the corners with corner brackets for support. Slide the legs into the corners from the outside so the bolts in the legs go through the holes in the corner brackets. Once the bolts are through, slide the washer up the end of each bolt to protect the bracket, then twist the nut on. Most people will be able to get it tight enough with their bare hands, and using your hands will help you avoid tightening too much. If your table comes with three or four leaves, then it needs a fifth leg to support them. The fifth leg has one bolt sticking out the top, and bolts to a bar in the center of the table. You will have to slide the table open enough to get your hand around the bar. Now that your table is upright, you can add leaves if you like. When you open the table top, you will see dowels sticking out of one side of the opening, and holes in the other. The leaves have the same dowels and holes to line up. Slide them together, close your table, and enjoy! The Fontana Dining Chair is a contoured Shaker-style chair with stylish dowels in the headrest. While the Fontana is available as an arm or side chair, the side chair has unique corbels adding beauty and strength between the back and seat. In the video, we’re showing the side chair in rustic cherry with a distressed finish. Call us if you would like a custom finish on any piece you order.